Misunderstanding about rotation is widespread. One common misconception is that the hand or the wrist alone rotates. 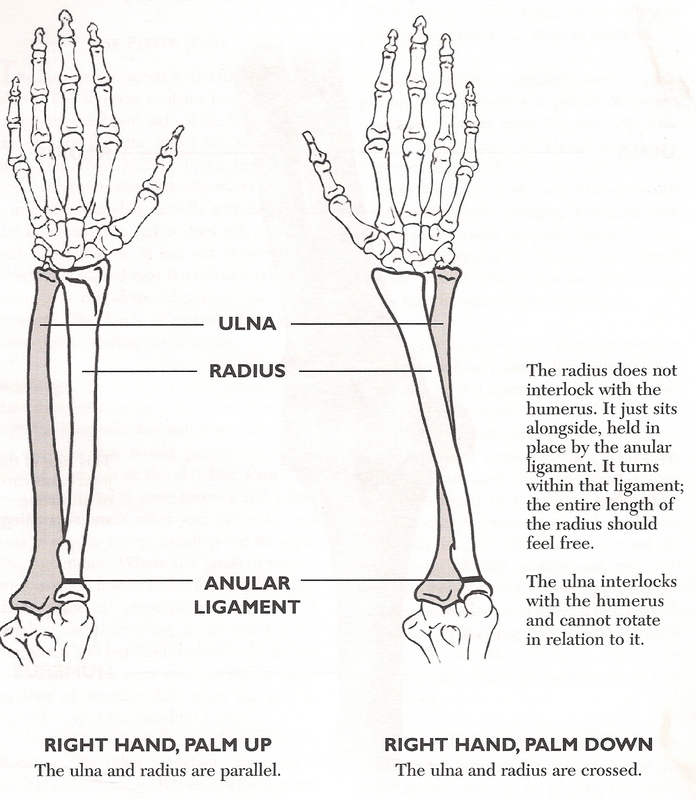 However, as the image below depicts, the fingers, hand and forearm rotate together around the ulna (Mark, 2003, p. 82; Ortmann, 1929/1962, p. 17). Forearm Rotation (Mark, 2003, p. 82). © 1998, 2000 by Benjamin J. Conable. Distributed by GIA Publications, Inc. www.giamusic.com Used by permission. All rights reserved. Some have expressed incredulity that this “exercise” is practical for playing (Yankovitch, 2011; discussed in Durso, 2011). This criticism often arises from misunderstanding the early stages of retraining, whereby rotation may be large to counteract the symptoms of a tight forearm. Understandably, large beginner rotation may seem peculiar to those unfamiliar with the process. I can relate to one symposium attendee’s account of “dozens of bemused, concerned, or recently enlightened pianists” at Taubman symposia “rotating in cafeterias and along streets” (Doherty, 1999, p. 265-266). Fraser is particularly dubious that double rotation exists, let alone is helpful in moderate to high speeds. He dismisses rotation in fast speed or loud chords as “obviously physically impossible”. However, he concedes that in fast tempi a “neuromotor trace” of rotation may remain (2010a, p. 143). Indeed, when the rotation is minimised with lively hand and fingers, the double rotation becomes minute adjustments in the direction of motion, allowing balance and weight onto each key. Somewhat contradictorily, Fraser advises his students to work rotation into a passage, and then allow the rotation to become unconscious (2010b, p. 143). The same principle holds in learning rotation as taught in the Taubman Approach. Commonly, pianists become trapped in the large, retraining stage, concerned that if the rotation is invisible, they are no longer rotating. In one memorable masterclass, Taubman used humour to persuade a student to minimise the rotation, threatening, “Listen honey. I could stick a gun to your head and you’d still rotate. Let it go!” (Taubman Institute, 1995, see DVD 1). Thus, while Fraser indisputably differs in his approach to rotation, some points of contention appear to be semantics, which could well be resolved through Fraser experiencing a lesson with a skilled Taubman teacher. Rotation is difficult to understand, and to teach, as acknowledged in the literature. Conable describes rotation as the “trickiest” element to communicate and master (2000, p. 59). Similarly, Mark emphasises the section on rotation as “the most important part” of his book (2003, p. 80). If applied or taught incorrectly, rotation can be dangerous, which is why Golandsky cautions against teaching rotation until the skill has been deeply understood and well integrated into the teacher’s playing (Lessons, April-July 2009). Conable, B., & Conable, B. (2000). What every musician needs to know about the body: The practical application of body mapping to making music. (Rev. ed.). Portland, OR: Andover Press. Doherty, M. (1999). Practice imperfect. Descant, 30(4), 262-266.